If you read my blog regularly, you will know that I always mention hormonal breakouts on my jawline and neck. I also complain about all the scarring and redness around those areas and any marks left after occasional blemishes on the rest of my face. I didn't really want to take any pills or antibiotics to deal with my problem, so I waited patiently for my hormones to calm down and I think that my skin is finally at the stage when I can deal with all the damage. That's why I was absolutely ecstatic, when I was contacted by www.sknclinics.co.uk who invited me for a consultation at their Glasgow clinic and offered me a course of treatments I might need to get my skin back to normal. I was considering booking an appointment and treatments anyway, so the timing was absolutely perfect. I went for my first visit last Monday and I am happy to report that I decided to go ahead with the treatments. First of all, the consultation is completely free and you simply book your appointment on the phone or fill in a form online to request a callback to arrange a suitable time. The staff at the Glasgow clinic were lovely and I was asked to take a seat and fill in a quick questionnaire, including all my details, some questions about my medical history, skin conditions/concerns and any treatments I am interested in. After filling in the questionnaire, my nurse Angela took me to a treatment room, where she went through some of the questions again, in more detail. She also told me more about the treatments I was interested in and we discussed my current skincare regime etc. I wasn't sure what kind of peel/s I would need, but I didn't want them to be too strong. I was asked to lie down on a chair/bed and the nurse had a closer look at my skin with a bright light. She reassured me that my skin has a nice texture and that there isn't any serious damage that needs strong chemical peels and I was recommended a course of 6 glycolic acid peels and as far as I can remember, their strength will be 30%. There is no downtime, which really appealed to me and I will be able to get back to my normal life right after the treatments. I will be having each peel two weeks apart and I have been told that most of the scars and red marks I have on my face should be gone after the full course of treatments. Exciting! The glycolic acid peels cost £80 each, but you can book more than one in advance and save some money with offers like 3 for 2 and 6 for 4. 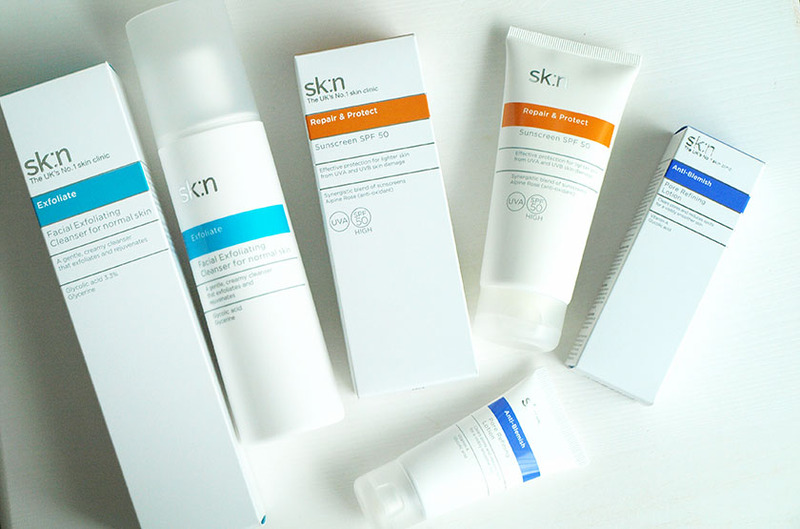 After the consultation, I was gifted some Sk:n products (suitable for my skin type) to take with me and I have been using them since Monday to prep my skin and protect it from the sun. The Exfoliating Facial Cleanser* (£24.75) is a gentle, cream formula with 3.3% glycolic acid and it leaves my skin soft and rejuvenated every time I use it. It smells lovely, feels very luxurious and doesn't leave a residue on my face. I can definitely feel the glycolic acid in it on any fresh breakouts, but it doesn't tingle or anything. It is a gorgeous formula. The Anti Blemish Pore Refining Lotion* (£25.75) is incredible too and I can see the effects of it already. It makes my skin look clearer, reduces the size of pores and helps to prevent breakouts. At the moment, I am using it allover my face, but once my skin looks clearer, I will just use it on affected areas. A little goes a long way, so it's quite good value for money. I was also advised to use SPF50 every day. 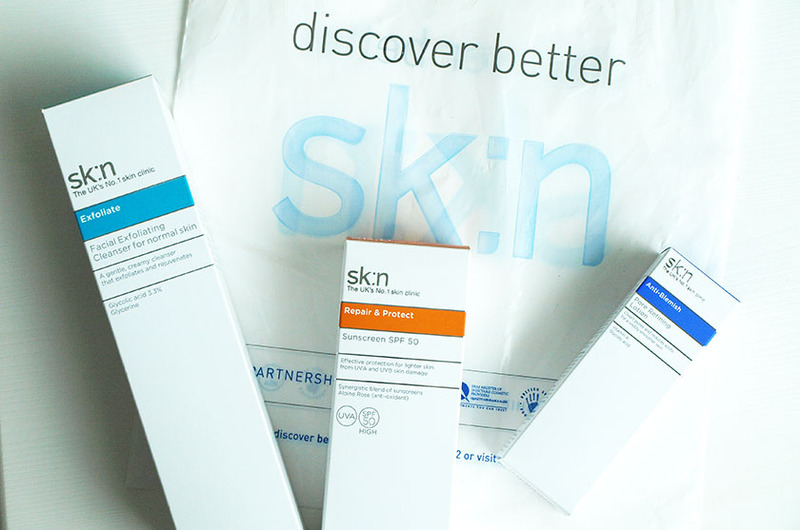 It is something I already do anyway, but I was happy to try the Sk:n Sunscreen SPF 50* (£18.00) on my face. It isn't too heavy and it works well under makeup. I am trying to avoid being in the sun for too long, but it is always good to wear high SPF to protect the skin anyway. I don't want any of the scars going dark or becoming worse in the sun. I will be using this SPF post treatment as well. I must admit - I am really excited for my first treatment at my local Sk:n Clinic on Monday and I can't wait to share my results with you. I will be adding before and after pictures on the blog and I am hoping to have almost flawless skin after my 6 glycolic acid peels. I am simply sick of wearing my hair down to cover the redness and scars and I don't want to wear high coverage foundation every time I go out of the house. I am lucky to have the centre of my face relatively clear so you can't really see any blemishes on my photos, but believe me - my profile ain't that nice :) I am trying to laugh about it etc, but it is quite depressing and I am not really used to having problems with my skin. I was blemish free most of my life and my hormones went crazy after I had a baby. Fingers crossed it all goes well and I can have my blemish free face back really soon. 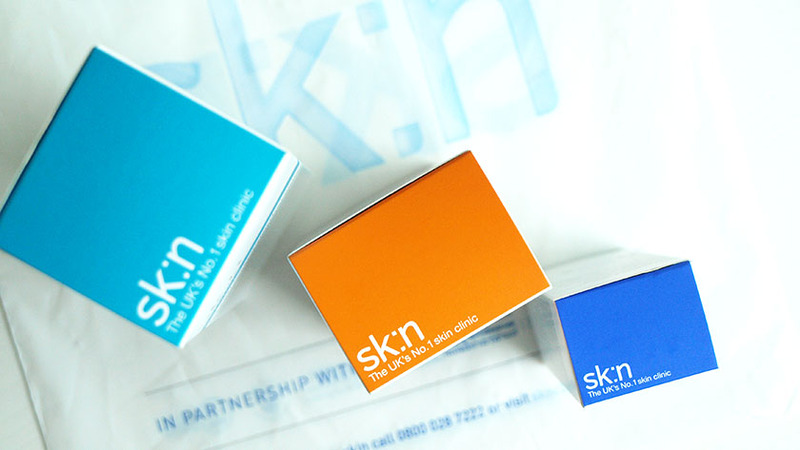 Have you tried glycolic acid peels or other treatments at sknclinics? Are you considering this kind of treatment? *I am having complimentary treatments and I was kindly gifted all the products.